We are a team of eight people with close links to the Castle Baynard Ward. 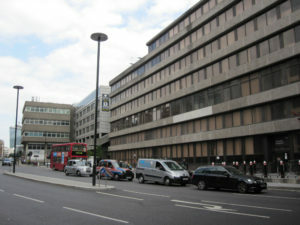 The Castle Baynard Ward is one of 25 in the City and is situated in the South West area of the square mile. Like the rest of the City the residential population is small comprising some 400 residents but this is increased each weekday by approximately 34,000 people who commute into London to work in the Ward. This profile is typical for the City as a whole where the corresponding figures are approximately 7,400 residents and 380,000 workers. 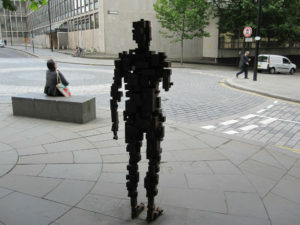 These figures are swelled by a further 2 million visitors a year to St. Paul’s Cathedral. The boundaries of the ward have changed significantly over recent years, due to reorganisations for the purposes of electoral balance. The most significant recent change was in 2003 when a large area of the City west of New Bridge Street (see this map) was added into the ward from Farringdon Without. The last boundary change in 2013 was comparatively minor although the number of Councillors was increased from 7 to 8 to reflect the changing demographics within the City. The current ward is now one of the largest in the City and is represented by 1 Alderman and 8 Common Councillors in the City of London Court of Common Council. The Ward contains a wonderful range of notable historic buildings the most famous of which is Wren’s masterpiece St. Paul’s Cathedral. This article highlights a number of these. The national press have vacated Fleet Street over the last 20 years (which is now designated as a Principal Shopping Centre area in the latest City Draft Local Plan) but the area is still thriving with legal firms and banks moving in to occupy the vacated space. Despite the migration of banks to Canary Wharf there is still a significant banking presence in the Ward. The number and variety of businesses contained within what is a small geographical area are astonishing. The ward contains over 700 businesses. These include 241 Professional Services Firms (Legal, Consultants, Accountants etc. ), 230 ‘Industry’ (Retailers, Pubs and Restaurants, Healthcare, Hotels etc. ), 52 Financial Services (Investment Management, Hedge Funds, Brokers etc. ), 42 Property Services, 35 Media Companies, 34 IT Companies, 25 National Organisations, 14 Banking, 13 Representative Agencies, 10 London Wide Bodies, 10 Education, 4 Arts & Culture, 3 Central Government and 2 International Organisations. As is true for most of the City, the building stock in the Ward is continually being redeveloped and many of the newer poorer quality buildings put up in the Ward after the second world war and in the 60s have been demolished and redeveloped – a recent example being the area around New Street Square north of Fleet Street which has created a number of high quality striking modern buildings containing offices, and shops around an attractive contemporary ‘pedestrian only’ open square which is heavily used in warmer weather by office workers. Two new large hotels have opened in the Ward recently – the Grange near St. Paul’s Cathedral and the Premier Inn in Dorset Rise which occupies a former office block that was vacated by KPMG. 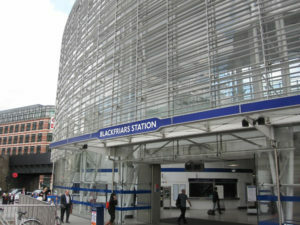 Blackfriars station which serves as a main terminus between Kent and South London has undergone a major redevelopment which was largely completed in 2012; the objective was to increase the length of trains that can be accommodated in the station by 50% and to double the frequency of trains that can be serviced in peak hours. The project created a common entrance for underground and over ground services at the north end of the rail bridge spanning the River Thames, and increased the length of the platforms utilising the full width of the bridge. In addition a new station was constructed on the South Bank of the Thames for the first time in 120 years. The roof of the new platform over the Thames rail bridge is clad with an array of solar panels that are capable of producing up to 1MW of electrical energy. To conform to the City Planning Policy future developments will seek to protect office floor space so that conversion of existing buildings for additional residential use will be limited. Given the proximity to St. Paul’s no high rise buildings will be allowed in order to conserve views of the Cathedral and these will be located in the East part of the City. The newest development in progress is Carmelite Riverside at 50 Victoria Embankment next to Sion Hall in the Whitefriars Conservation area which will deliver a new 135,000 square foot office building. The building will be ready for occupation in the spring of 2014. The modern building fronting Embankment is being completely redeveloped and the adjoining building to the rear (Carmelite House built in 1898 which is listed) is being gutted but the grand impressive brick-built façade with mullioned windows is being preserved. The most obvious area remaining in the Ward with potential for major redevelopment is that containing the brutalist buildings on the south side of Queen Victoria Street just east of Blackfriars Station. No plans are currently underway for this yet and given their highly visible sensitive riverside location in the foreground of the view of St. Paul’s from the South Bank any plans are likely to be heavily scrutinised and contentious. The other imminent major development which will have an impact on the Ward is the development of the Thames Tideway Tunnel, part of the project will develop an intercept at the existing local Fleet river combined sewer overflow (CSO), and connect it to the new main tunnel. The work will include the construction of a new area of reclaimed land in the foreshore, in front of the existing river wall and opposite Sion College. This area will house underground structures to connect the CSO and the low level sewer to a shaft approximately 53 metres deep with an internal diameter of approximately 24 metres. The shaft is required to transfer sewage flows from the CSO to the main tunnel. While most structures will be within the new areas of reclaimed land in the foreshore, several ventilation columns, a kiosk and a new public space will be permanent above ground features (see right). 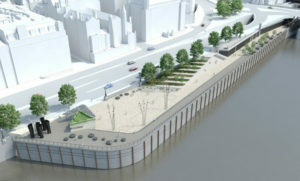 In addition the works will include a new pier to replace Blackfriars Millennium Pier. Construction is planned to start in 2016 and will take approximately four years. If planned carefully this project has the potential to deliver an attractive new amenity to the Ward in addition to substantially reducing pollution and improving water quality in the Thames. The opening of the Millennium Bridge greatly improved access to (the recently cleaned) St. Paul’s Cathedral, and this has significantly increased visitor numbers to the immediate area and the rest of the City from the South Bank and Tate Modern. A number of new restaurants and coffee bars have opened at street level in the buildings on the South Side of St. Pauls Churchyard which have recently been redeveloped to cater for the increased number of tourists. 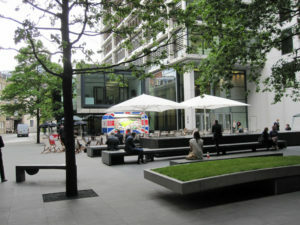 New Street Square (see right) is also now being used to stage food markets, City of London Festival free events and outdoor screenings of major sports events such as Wimbledon in the summer months. 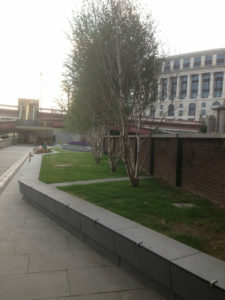 A new small green space (see right) has been created by the riverside as a result of the redevelopment of Blackfriars Station. There are two historic Wren Churches in the Ward built following the Great Fire; St. Bride’s (currently undergoing a major refurbishment) which hosts an extensive range of concerts and events and St. Andrew-by-the-Wardrobe which stages free lunchtime concerts. The Lunchbox Theatre is one of the best kept secrets in London, hosted in the Bridewell Foundation building, performances typically start at 1pm and last for 45 minutes. In addition evening performances are staged, as well as tours of the library and a good basement bar is available for refreshments. Dr Johnson’s House to the north of Fleet Street is the early 18th century house in which one of London’s greatest literary characters produced his English Dictionary in nine years, working in the attic with six assistants. The house is open to the public and hosts a regular programme of events (www.drjohnsonshouse.org). 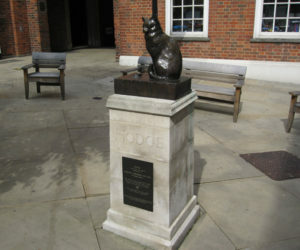 The statue of Hodge, Samuel Johnson’s pet cat enjoying an oyster (see right) can be seen in Gough Square in front of the house. 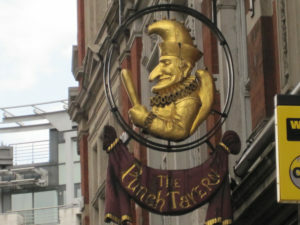 The Fleet Street area hosts a large of number of legendary pubs formerly frequented by journalists – the most notable include the Cheshire Cheese, the Tipperary, the Punch Tavern and The Bell. Castle Baynard also has a thriving Ward Club which celebrated its 100th birthday in 2009. Membership is open to anyone with a connection to, or interest in the Ward. Nowadays ward clubs operate mainly as social clubs, organising visits to places of interest in London and the City and functions such as Civic Luncheons, at which they entertain the Lord Mayor and Sheriffs. More details can be found on the Club’s website (http://cbwc.org.uk). There are two ward charities which make grants to young people for educational purposes, the Castle Baynard Educational Foundation and Alderman Samuel Wilson Fund. While these principally make grants to students at schools closely connected with the City, they are sometimes able to make small grants to other young people with a Ward or City connection. For further information contact Catherine McGuinness and she will pass your query to the clerk. catherine.mcguinness@cityoflondon.gov.uk or 07909876115. Please note that the Foundation is no longer able to make grants to individuals, as our funds are fully committed to making grants to a small number of educational institutions with close connections to the City of London. Thomas Carpenter’s Trust has been set up to provide financial assistance for the education of suitably qualified applicants who must be under 25 years of age and be undertaking a full-time course of study; they, or their parents must have lived or worked in Bread Street or Cordwainer Wards or the adjoining Wards for three consecutive years. This area effectively covers the Wards of Bread Street, Cordwainer, Castle Baynard, Farringdon Within, Dowgate, Cheap, Walbrook, Queenhithe and Vintry. Applications should be made in writing to the Secretary to the Trustees, Richard Martin at St Botolph’s Church, Aldgate High Street. London EC3N 1AB, (tel: 020 7929 0520) before 31 July to be considered for the following academic year. The Trustees meet each September to consider all applications. Alternatively please send an e-mail to: lm800aat@hotmail.com. The Educational Foundation of Thomas Carpenter was set up by the Wills of John Lane (1670) and Thomas Carpenter (1731) and after several amendments was consolidated and regulated by the Charity Commissioners in a scheme dated 1960. It was further amalgamated with the Cordwainer and Bread Street Wards’ Foundation in 1997. It is a registered charity No. 312155.